As I said, my Parents are over at the moment. I would publish a photo of them but, my Mother hates having her photo taken (I know where I get it from now!) so instead, I will post a picture that I took whilst I was with her! We have done quite afew things so far, Adrien had loved the warm waters for swimming, a far cry from the French Sea that he is used to. 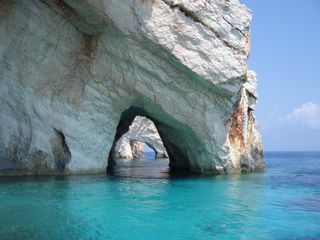 We went on a trip the the Shipwreck , also taking in the Blue Caves (as shown above). The weather has been a little hot and it has reminded me how harsh the sun can be. I am used to staying out of it. Now I am doing a few 'touristy' things, I realise why so many people get burned (burnt?). Quite a short post as I am going to see them however, I wanted to show you a link to one of the most amazing blogs I have seen. It is where people send postcards of their most intimate secrets. Great design on the site as well. http://postsecret.blogspot.com/ Take a look at it, I can guarentee you will hooked on it! There is a lot of fun there but also some quite heavy matters. I can not possibly put in this link without crediting the source of the information, and her blog, my work colleague, Ms B. She is a remarkably funny young (ish!) lady, she really should be in comedy, not Poker but, life takes us in some funny direction.